Have you ever been afraid of monsters? Have you ever had nightmares? I am almost certain that you have. To different degree, monsters and nightmares are our shared experience. They represent the dark side of what makes us human. Every culture, every language, every tribe or nation has list of monsters. Even the Bible has panoply of monsters and demons, sea monsters and swamp monsters and fiery snakes and demons of pestilence. There are several human strategies on how to cope with monsters. The most common and straight forward strategy is to fight them and chop off their heads. The monsters (or fear of monsters) can be fought across the whole time spectrum. The fight could take place in the past, in the approximate present as well as in the future. Fear of monsters can be defeated through the reference to the past - there are numerous mythical stories about how the world was created by defeating primordial monsters (for instance Isa 51:9) . Monsters were defeated; they might linger on the fringes, but they are not a founding principle of the world and their power is limited. Monsters can be defeated in the present - there are numerous legends about heroes defeating monsters and demons during recent (although often legendary) times (Matthew 12:22ff). Even our modern scientific world view can be seen as such an instrument and an ally against nightmares. Monsters can be defeated by delegating the fights into the future. Prophetic revelations and apocalyptic stories often describe such fights and final victories (Revelation 20). Their message is clear, monsters might look powerful now, but just wait to see, their rule is limited and finite. Biblical testimony utilizes all the previous head chopping strategies. Unfortunately there is a problem with these fight and defeat strategies. Chopping off monsters’ heads usually does not work; monsters can grow new heads quickly as we all know. But Bible presents one special and surprising approach -- I call it “domestication”. With this approach the existence of monsters and nightmares is not denied, monsters are not being sought, fought and cut in pieces. They are accepted as part of the world, they are perceived under divine rule together with the rest of the world. This domestication strategy is surprisingly effective. It deprives monsters of their nightmarish evil streak and supra-natural dark aura and makes them into overgrown puppies and calves (Psalm 104:25f or Job 40:10ff). This is an example of biblical realism, and a recognition, that true monsters might not be lurking out there, but inside here. This Sunday we continue with the Book of Jonah. The second chapter is an excellent example of this domestication strategy. A primordial underwater monster (larger-than-life fish), obeys every divine command, while the rebellious prophet cannot be bothered, not even in his “devout” prayer. Isn’t it an interesting insight into the whereabouts of monsters? Are they really external or is it possible that they are internal and masquerading in piety? Is Jonah in the monster or do we observe a prophet with a monstrous problem? 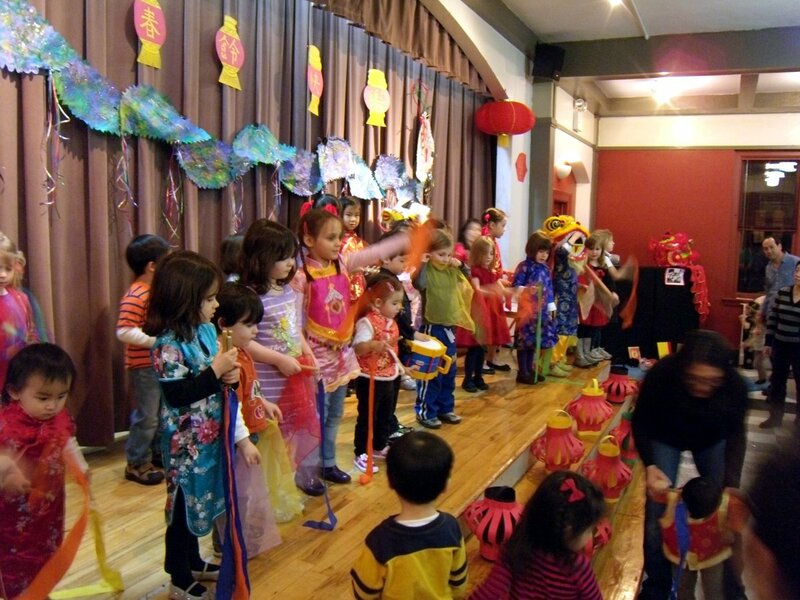 This evening Rutgers Community Programs celebrated Chinese New Year. This year being the year of Dragon brought to us many dragons dancing on and off the stage. It was interesting to observe reactions of the little ones in the audience. When the first dragon appeared and danced vigorously among us, all Asian babies were in the seventh heaven, while some European kids started to cry. In Asian cultures dragons are good spirits, for Judeo-Christian people they represent dangerous monsters. Ah, those inbred archetypes! Do you think that God laughs? I am certain of it! Although I do not mean it in literal anthropomorphic sense. God must have a divine sense of humour; how else could God put up with our human race? God’s divinely sparkling humour shows all the time in the Bible, even in the Ten Commandments, as serious as they are! They are recorded in the Bible in two different versions (Exodus 20 and Deuteronomy 5). Both versions differ slightly, but just enough to make a mockery of any stupid literal legalism. And the central story of our faith (the Gospel) is preserved in the Bible in no less than four versions (at times mutually exclusive) and in hundreds of ancient manuscripts and thousands and thousands of different readings. I enjoy thinking about how the Holy Spirit utilised the sublime aspirations and individual egos of those ambitious gospel authors (and copyists) to preserve the rich theological diversity of the early church. Some people take themselves way too seriously. Often religious people take their religion even more seriously! Religion is no laughing matter, oh no no no! And God laughs at our human self-centeredness and buffoonish religious self-importance. To protect us from macabre ritualistic religiosity, God endowed humanity with a potent medicine, a sense of humour to de-mask falsehoods, pretenses, ostentatious piety, empty rituals and idolatrous ideologies. The gift of humour is one of the biggest healing gifts which we were given and thankfully theologians have started to pay attention to it in the last few decades. Thus it slowly starts to percolate into the church that biblical storytelling is infused with lighthearted humour in many forms. 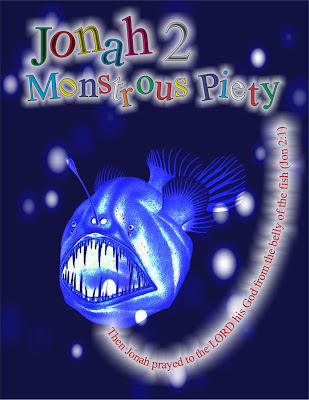 This Sunday we are starting a mini-series on the “prophet” Jonah. Forget about those deeply-entrenched moralizing messages and hard-to-believe strange miracles (whether taken literally or allegorically). Modern scholarship is quite clear - exaggerated features of this story are an intentional part of its farcical strategy, together with parody, satire, irony, and verbal wit. Our city (NYC) proverbially never sleeps and I think it is one of its biggest problems. In the subway and on sidewalks I see rows of zombiaits (zombie-like people) who clearly have not had enough sleep for many nights. Such lack of sleep is self-defeating, because a good night's sleep has curative properties, and good sleep keeps us sane. Eyes can spark again, and minds get nimble after a good rest. Just ask neurologists, psychiatrists, and psychologists. I am just a church minister who likes to study Ancient Near Eastern religions, so I can give you some ancient religious examples of healing dreams. The practice is called incubation. It was an ancient religious practice which sought divine healing and revelation in a dream. he felt bitter and sobbed. like pound weights onto his bed. in his crying slumber came. he laid down in slumber and curled up. to his vision Father of Adam. that the page of El sheds his tears? thus girded he gave the holy ones to drink. he took off his clothes and went to sleep. 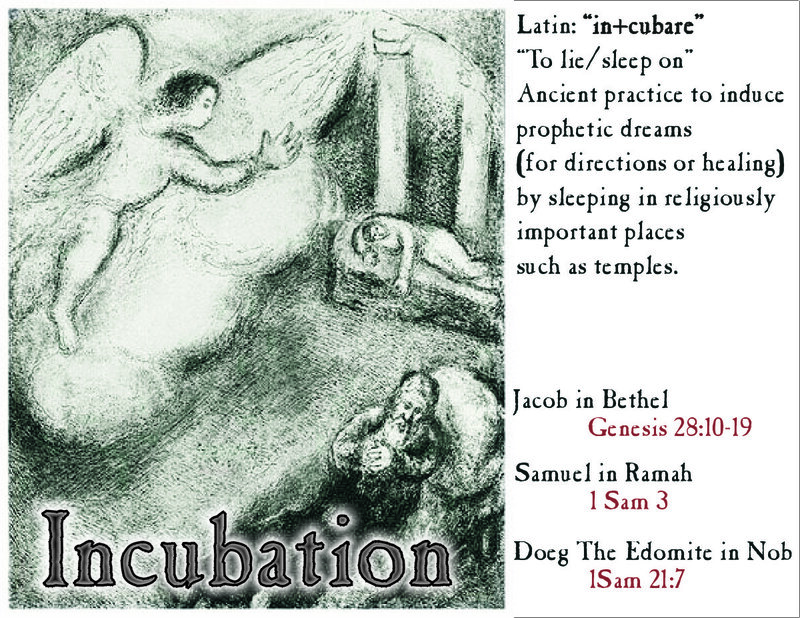 Both these incubation stories are positioned at the beginning of lengthy epical compositions and they set a stage for the following outwinding drama, just like Jakob’s dream in Bethel (Genesis 28:10ff) or Samuel’s dream in Ramah (1 Samuel 3). 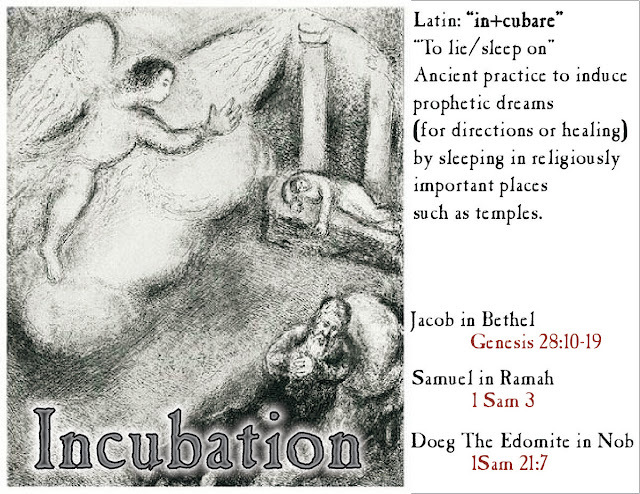 The ancient practice of incubation was intended to induce prophetic dreams (for direction or healing) by intentionally sleeping in religiously significant places (such as temples or some other holy places). The blind man saw a dream, in it Asclepius came up to him and with his fingers opened his eyes and he first saw the trees in the sanctuary. When he woke up, he walked out healed. This inscription alone has some interesting contact points with several new testament healing stories. It is even possible, that some kind of a Asklepion (Asclepios’ healing center) is described in John 5:1-18. My message to our city which never sleeps is simple, close at least one eye occasionally. Good sleep has healing properties! Dreams can cure! Dreams have power to clarify the vision and bring hope again. 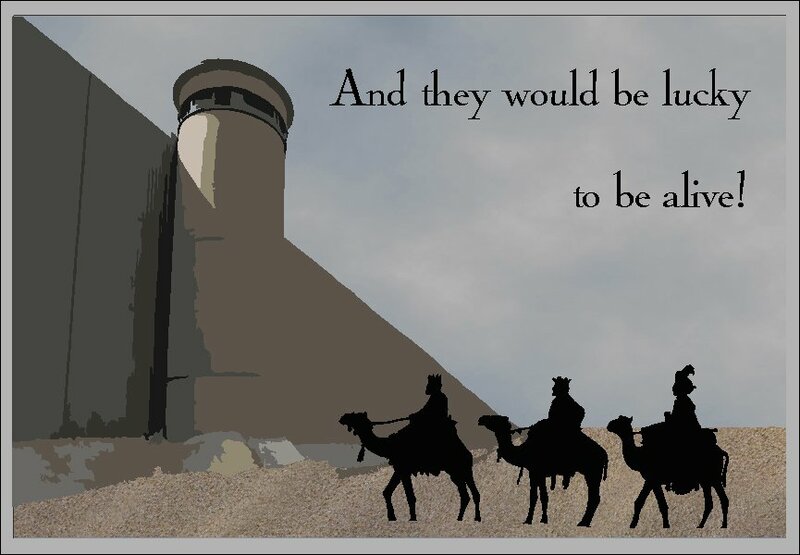 Just look at those famous dreamers, Keret, Daniel, Jacob, Samuel, or Martin Luther King. Their dreams had surprising power to transform not only their lives but also to heal or change their society and world. Do you like hodgepodge? I love it! Although, back at home we would probably call it eintopf (“one pot” in German). And one such hodgepodge is coming our way this Sunday. The Biblical reading this Sunday is the fabulous story of the Magi. Matthew, or perhaps oral authors before him, pulled together all the material they could lay their hands on: different and incredible stories and traditions. 1) Fresh in their mind was a flamboyant royal delegation from Armenia, which suddenly appeared in Rome at 66 C.E. 1a) And indeed, this delegation reportedly returned by another way. 3) Their ancient world-view counted on the heavens and the earth being connected as if by strings. Stars influenced the fate of humans, and some special humans (such as Alexander, Mithriades, Julius Caesar, or Abraham and Moses) received special attention from the stars. 3a) Even "a traveling star" [sic!] could lead Aeneas all the way to a specific place for the future Rome. 4) From old biblical prophecies they quoted some old ones about David’s birthplace thus hinting at messianic expectations. 4b) psalms about nations and kings bringing their gifts to lowly Judeans. 5) And finally they flavored it all with the classical narrative plot of powerful enemies conspiring against an as-yet unborn hero. And one collage of a legend speaking to realities of our world.